Hello again golfers and a very warm welcome to our latest newsletter we hope that you've had a good week despite some rather wet weather! Last week we received the new copies of the 2016 Rules of Golf books that will come into effect from 1st January next year, there are four main rule changes to be aware that we will explain in further detail later on but did you know that the Rules of Golf booklets are distributed to no less than 96 different countries and they have to be reproduced in 36 different languages including Vietnamese, Tamil and Mongolian! Make sure that you pick up your free copy of the new rules book next time that you call into the club, you never know when you might need a rules book out on the course! It's the summer season's Presentation night this Friday 13th November starting at 7pm, whether you're a prize winner or not we hope that you can all make it for what should be a great night. There will be a three course meal with a late bar and disco after the presentations for the bargain price of £18 a person, all members and their guests are welcome to attend - as they say the more the merrier! All the Honours boards in the club house are also being updated this week with all the relevant winners' names on. Click here to view a list of all the prize winners from the summer - it would be great if you could all make it! It was the third round of the Winter League on Saturday but our golfers were lucky enough to play the majority of their rounds during a break in the wet weather and there was a good turnout of 26 pairs. The winners were Kieran Underwood and Steve Dunning with 23 points, they got off to a slow start over the first three holes but then they burst into life with an amazing five birdies in a row! Young Cheshire player Kieran contributed four of the birdies and Steve came in with an excellent two on the seventh hole, a solid par at the last ensured that they had the winning score for the day. In second place Simon Stephenson and Ian Wharton scored 22 points (Simon obviously played the sixth hole better this week!) And the pairing of Stuart Gray and Alan Tayler also finished on 22 points in third place. Remember that after eight rounds the top four pairs will advance to the semi-finals, round four is coming up on Sunday 22nd November at 11am. This Saturday it's the November Bogey starting at 11am. - Withdrawal of Rule on Ball Moving after Address - Rule 18-2b (Ball Moving after Address) has been withdrawn. This means that if a ball at rest moves after the player addresses it, the player is no longer automatically deemed to have caused the ball to move. A one-stroke penalty under Rule 18-2 will be applied only when the facts show that the player has caused the ball to move. - Limited Exception to Disqualification Penalty for Submission of Incorrect Score Card - A new exception has been introduced to Rule 6-6d (Wrong Score for Hole) to provide that a player is not disqualified for returning a lower score for a hole than actually taken as a result of failing to include penalty strokes that the player did not know were incurred before returning the score card. Instead, the player incurs the penalty under the Rule that was breached and must add an additional penalty of two strokes for the score card error. In all other cases in which a player returns a score for any hole lower than actually taken, the penalty will continue to be disqualification. 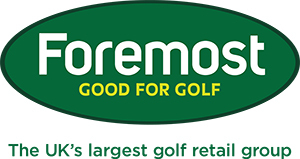 - Modification of Penalty for a Single Impermissible Use of Artificial Devices or Equipment - The penalty for a player's first breach of Rule 14-3 (Artificial Devices, Unusual Equipment and Abnormal Use of Equipment) during the round has been reduced from disqualification to loss of hole in match play or two strokes in stroke play. The penalty for any subsequent breach of Rule 14-3 will continue to be disqualification. 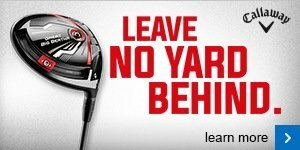 - Ban on Anchoring the Club While Making a Stroke - As announced in May 2013, the new Rule 14-1b (Anchoring the Club) prohibits anchoring the club either "directly" or by use of an "anchor point" in making a stroke. The penalty is loss of hole in match play or two strokes in stroke play. This week sees the return of our popular Christmas raffle prize draw, for just £1 a ticket you will be entered into a draw to win one of five prizes that are worth in total over £500, last year Alan Nevin was the lucky recipient of the first place prize - this year it could be you! So we have some great prizes, raffle tickets are available now in the shop! 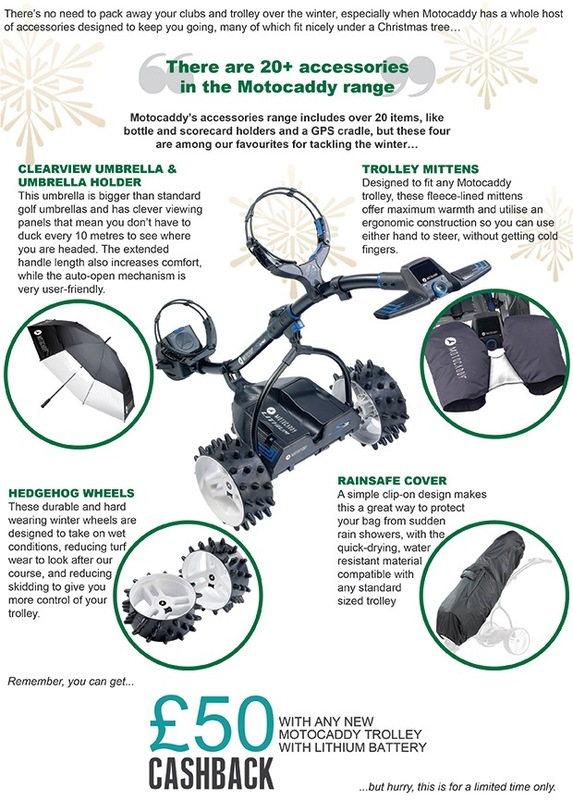 - Ben Sayers complete package sets (£229) - these are available in men's and ladies and are ideal for somebody just getting in to the game of golf who wants a quality full set at a reasonable price. - Masters compact stand bags (£39.99) - ideal bags for the winter, very lightweight with double carry strap and pop out legs to prevent bag falling on floor. - Callaway Super soft balls (£29.99) - special offer price on 2 dozen balls gift packs, save £10 on this popular low compression ball ideal for winter golf. - Masters disposable Hand warmers (£1.50) - not an expensive gift but a must have item for any winter golfer are these disposable hand warmers that keep warm for 6-8 hours, a great little stocking filler! Call in to have a look around I'm sure that you will find plenty of Christmas gift inspiration! 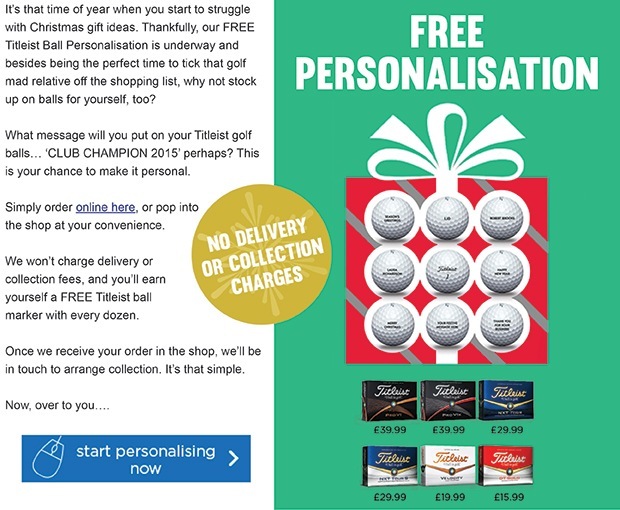 Remember that we have a great Christmas offer on Titleist balls, you can give a very unique present of the most popular balls in golf with FREE personalised text. If you have any more good suggestions let me know! If you're a lady golfer look out for our new ladies winter clothing arrivals, just arrived are new thermal base layer tops from Under Armour, thermal half zip layering tops from Nike and FootJoy thermal brushed pullovers and thermal vests. With this clothing you can keep warm on the golf course on even the coldest of days but also just as importantly you can look good, call in to have a look! The seniors played a nine hole Texas Scramble on Tuesday morning, they were very luck with the weather as the sun briefly came out and temperatures were quite mild again. The winning team with an incredible nett 22 score were John Sykes, John Gunning and our Honorary President Colin Maddock. Next week the seniors play the second round of their Winter League - Brian Whitworth is the early leader.